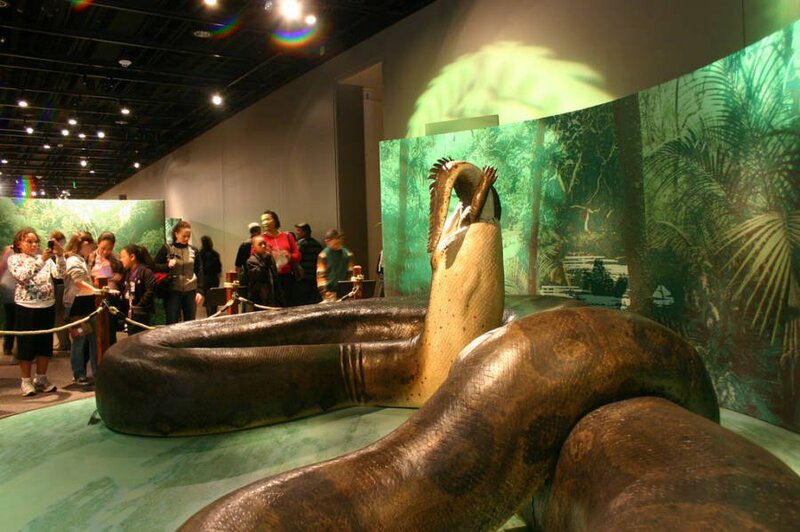 The Titanoboa is an extinct genus of giant snakes that lived around 60 million years ago during the Paleogene Period. 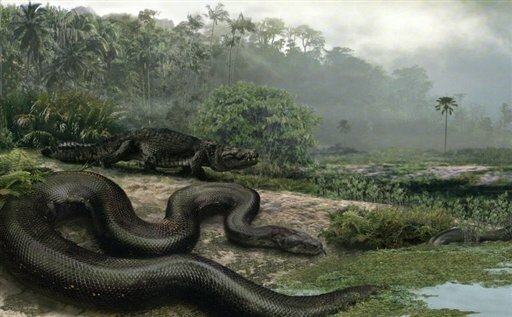 The snake was twice as long as the biggest modern snake, and four times as heavy as a giant anaconda. The discovery of this enormous reptile showed to the scientists for the very first time what kind of animal species ruled the continent of South America after the entire ‘Dinosauria’ clade was wiped out from the planet. Recently in 2009, while working in the mines of the Cerrejón Formation in Colombia’s La Guajira, the construction workers come across fossilized skeletons belonging to the early Paleocene Era. Among them were a few species of large fish and reptiles including some giant turtles, gigantic crocodiles, etc. A fragment of the vertebrae that was thought to have belonged to a crocodile species was sent for further studies. Upon close observation, the fossil proved to be of a giant species of snake. 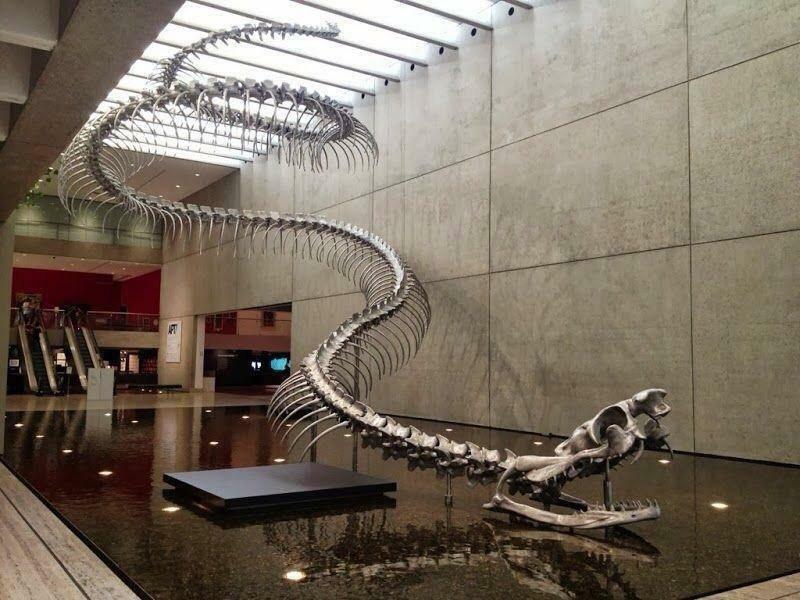 Being highly curious, a group of paleontologists expressed their eagerness to go to South America with the hope to discover more relics of this giant snake. Working for quite a few weeks, they were successful in finding several bones samples of larger vertebrae, as well as a large skull. Eventually, the researchers could conclude that this titanic snake was the largest ever snake discovered so far. 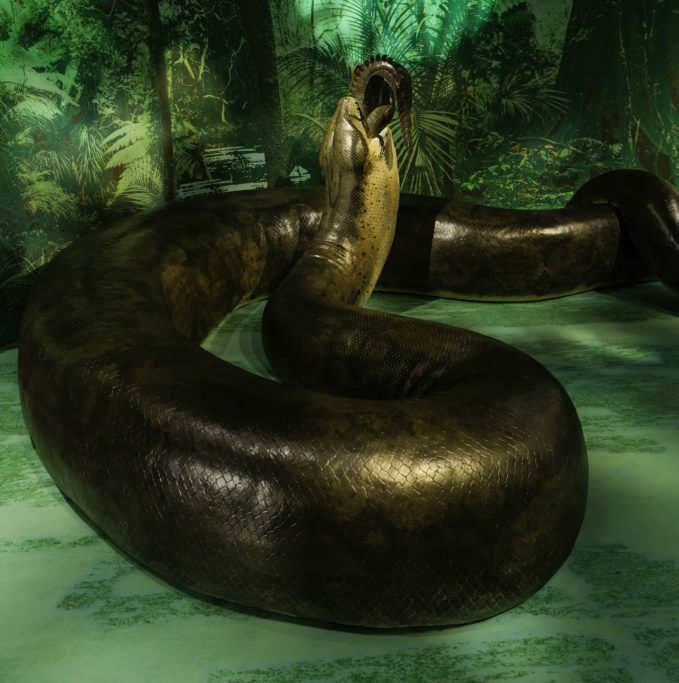 Considering their extraordinarily enormous size and the site where it was unearthed (the Cerrejon jungle), the scientists named it Titanoboa cerrejonensis (scientific name). The discovery was not merely important in the history of paleontological studies, but the whole site proved to be of a great contribution to science, revealing a whole new type of ecosystem in the continent of South America that was previously unknown. At 42 feet (12.8 meters) in length and 1135 kg in weight, it was the biggest snake in the world. However, they are more closely related to present-day boa species rather than the giant size anacondas. 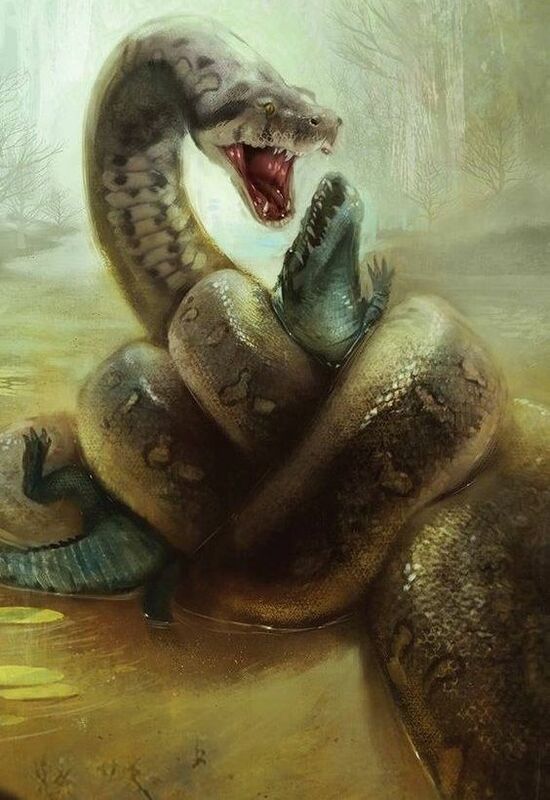 Nonetheless, most paleontologists opine that this monstrous serpent behaved more like today’s green anacondas and would spend most of the day in water in order to support their enormous size. Quite like the present day constrictors, this reptile possessed a highly muscular, legless body, perfectly adapted to wrapping around its huge prey, and finally squeezing the victim to death by constriction. They do not carry venom, but their exceptionally strong jaws and large mouth cavity helped them dislocate their prey and then swallow it down whole, even if the victim’s body were bigger than the snake’s head. They also had a forked tongue, which helped them locate their prey even under water. They are thought to be expert ambush predators, having the ability to chase and strike their unsuspecting prey at incredible speeds. Their diet included all kinds of giant reptiles, fish, mammals, etc. available for consuming within their habitat. Titanoboas would hunt both on land and underwater. This was probably a behavioral adaptation for two reasons. Firstly, there was no animal worth being the prey of this giant creature lived strictly on land, and secondly, being solely a terrestrial hunter might increase the chances of damaging its internal organs out of its massive weight. Many scientists are strongly unanimous that the discovery of the Titanoboa was the ‘find of the decade’, and that, it is one of the most significant findings since the time the Tyrannosaurus rex was first discovered in 1905. 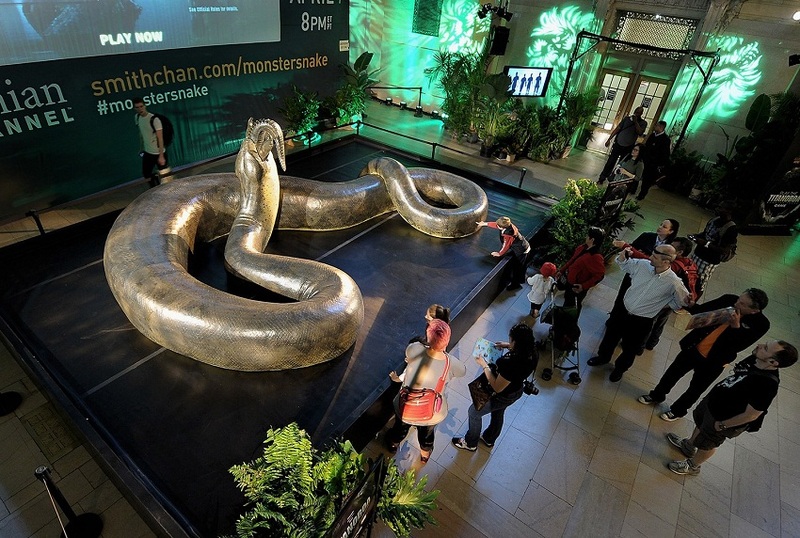 A 48-feet, 2,500-pound live size replica of the snake was displayed in NYC’s Grand Central Terminal on 22 March 2012 for the promotion of a TV documentary on the Smithsonian Channel named Titanoboa: Monster Snake that was telecast on 1 April 2012. Published on February 3rd 2019 by admin under Reptiles. Article was last reviewed on 8th April 2019.